All of us on the staff at St. Francis Xavier (College) Church are excited about your engagement, and we look forward to helping both of you prepare for the wedding and for the marriage. We realize that preparing for your marriage might well be your most involved connection with the College Church up until now. That’s OK. We would like to make you feel that you chose the absolutely right place to prepare for your new life together. If we are lucky, maybe you will become a more involved and active parishioner after the wedding day. We promise to do our best to make sure that the preparations and the years ahead are blessed by your association with College Church. This guide describes our suggested plan for helping you prepare. Read this carefully. Ask questions. We are very aware that every wedding is unique. No two are alike. Still, we need to fashion your wedding into a marriage ministry that assures that we are doing our job – not only providing a memorable wedding, but also launching a holy marriage life. We always keep our eyes on that responsibility. We also need to be sure that we can efficiently, yet gracefully, accommodate all of the many couples who ask us to help. The College Church is a busy place. All we require is your cooperation with our policies and guidelines. If we work together, the wedding and the marriage will be the best. As soon as our wedding ministry director phones you, she will be your contact with College Church. Any scheduling concerns and any questions should be directed to her. Ask questions. Please, ask questions. We want to make this a beautiful wedding, a blessed marriage. Priests, deacons, musicians, and our support staff all want you to be pleased that your marriage began at St. Francis Xavier (College) Church. Enjoy this time of preparation. Be joyful about the whole experience. Congratulations, again. We hope our part in your plans will help you to see forever. That’s where you are headed together. Thank you for letting us help you. Once you have contacted the wedding ministry director, Sandy Hauck (sandy@sfxstl.org), provided the requested information and placed a deposit on your ceremony, you should invite a Priest or deacon to officiate. It is the responsibility of the couple to provide their own celebrants. Only Catholic Priests or deacons may officiate at weddings in College Church. We recommend the website togetherforlifeonline.com for you to use to help in planning your wedding liturgy. The Catholic Church requires that all who wish to be married go through an approved marriage preparation seminar. College Church has a model program with full Archdiocesan accreditation. Call Joe Milner (314-977-7305) as soon as possible to get available dates for this program. A Pre-Nuptial Investigation form with any dispensations that may be required. This must be completed by you and your Priest (or deacon) and returned to College Church at least one month prior to your wedding. This documentation is required in order to register your marriage in the parish and Archdiocesan sacramental records. If either party was married civilly or in a religious ceremony you must present annulment documentation to your priest. If you have yet to begin the annulment process we are happy to guide you through the process. Certificate of your approved marriage preparation seminar. Friday: We do offer Friday weddings. The time is flexible and based on church availability. If there is a Friday night wedding reserved, the rehearsal schedule will be for Thursday night. With the volume of weddings and liturgies at College Church, it is essential that the rehearsals and weddings start and end on time. If your bridal party is more than 15 minutes late for your rehearsal time may be shortened to accommodate the schedule. The contract should be completed and returned to College Church, together with payment. The fee to secure the church is ½ of the Church fee. This may be paid with a credit card, check or cash. This deposit is non-refundable. The balance is due 30 days prior to your wedding date. This fee covers the services of your wedding coordinator/sacristan at both your rehearsal and your wedding. It also covers the services of the Director of Music for consultation and the coordination of your wedding music and musicians. The church fee is $1250 for a 10:30 ceremony time and $2000 for an afternoon ceremony time. We do provide off season discounts in January and February. The rental fee secures the Church for you from 1 hour prior to your wedding ceremony until 30 minutes after the conclusion of the ceremony (for photographs). The cost of College Church musicians is an added fee. See Music Section. A respectable offering should be made to the officiating Priest or deacon for his services in preparation and presiding at the liturgy. Four hundred dollars is suggested. If your preparation consists of different parties preparing and presiding then the offering should be split between the parties. We will pass on a 5% discount if the payment is made in full at the time of your reservation. Your wedding is a liturgical sacramental celebration of the entire faith community of College Church, along with your family and friends. All music before, during and after the wedding will be music that is customarily used at Catholic liturgical services. The College Church follows guidelines that are consistent with those of the Archdiocese of Saint Louis. Therefore, all music is to be liturgical, sacred, or appropriate classical music. Secular music is not suitable for the wedding ceremony itself. Since the music sung by the assembly is the most important music of the wedding ceremony, a College Church pianist and cantor are required for every wedding. There is an additional charge of $200 for each of these professional musicians, payable at your wedding rehearsal. We are happy to advise you of additional instrumental options. We have an extensive roster of professional musicians available to play for your wedding; violin, flute, cello and trumpet are the instruments most often requested. The cost for each of these instrumentalists is $200, payable at your wedding rehearsal. Please consult Sue Martin (sue@sfxstl.org), Director of Wedding Music, before hiring any other musicians. Subject to review and approval of the Director of Wedding Music, you are free to engage outside soloists and musicians to perform songs during the Prelude or Preparation of Gifts. Please contact Sue Martin (sue@sfxstl.org) to discuss any plans for guest musicians. Approximately six (6) months prior to wedding date: Wedding Liturgy information will be emailed to both bride and groom. Three (3) months prior to wedding date: Wedding Liturgy Planning Form and Musician Hiring Contract should be completed and returned to Sue Martin (martins@slu.edu). Musicians are booked when the Musician Hiring Contract is received. Wedding rehearsal: Payment for musicians is due. Please contact Sue Martin (sue@sfxstl.org) with any questions regarding wedding music. In order to encourage participation at the ceremony, couples will often choose to create a worship aid (program) for their celebration. While the Director of Wedding Music will be happy to review a draft copy of your program, the design and printing of the program are the responsibility of the couple. Many couples believe that the beauty of St. Francis Xavier (College) Church does not require any added enhancement. If you choose to add to the beauty, here are some guidelines to follow when making your arrangements. College Church is an active parish church, and the sanctuary is decorated according to liturgical seasons and feasts. These decorations are part of any liturgical celebrations and will remain in place for your wedding. Flowers are never placed on the altar itself. If you will be having floral arrangements near the altar they must not interfere with liturgical movement of the ceremony. College Church does not provide elevated plant stands. Flower petals (real or silk) may not be dropped inside or outside the church. Your flowers and decorations must be removed immediately following your ceremony. All containers used for corsages, floral arrangements etc. must be disposed of before leaving the church. If the trash containers are full, please stack florist boxes neatly beside them. This is the responsibility of the attending florist, not the church staff. Due to the aisle width, vases and stands are not allowed in the aisle itself. Bows are permitted. They must be attached by rubber bands or ribbon ties only. There are 23 pews in the nave of the church. The only candles that may be used are the pillar candles already present in the sanctuary. The lighting of a unity candle is not part of the Catholic rite and is not allowed during the ceremony. We suggest having a unity candle at your reception. No other candles, including candelabras may be used. Runners: For safety and liability reasons, runners are prohibited. There are respective Assembly Rooms available for the ladies and gentlemen. The rooms will be available an hour prior to the start of the ceremony. It is available for assembly, touch-ups and photographs. Please do not plan on using the room for a dressing room. Personal possessions may be left in the rooms during the ceremony. The rooms will be locked during this time. However, you and your guests should keep with you any personal or valuable items. All coats, purses, make-up and garment bags must be removed from the room at the conclusion of the wedding. 30 minutes after the conclusion of the wedding the Assembly Rooms is no longer yours. College Church is not responsible for any items left in the Assembly Room. We ask that you respectfully clean up the Assembly areas before leaving the Church grounds. No food may be consumed in the Church or the Assembly Rooms. Water may be consumed only in the Assembly Rooms. Call the University Parking Office (314-977-2957) for information on availability for the Laclede Garage. 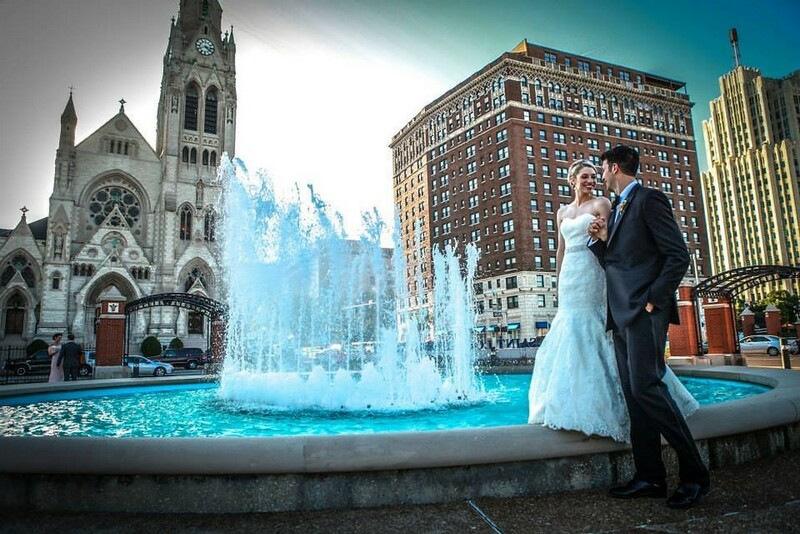 A flat fee of $150 will ensure ample parking for your rehearsal and wedding. Metered Parking on Lindell Boulevard is from 7:00am until 7:00pm Monday through Saturday. It is not permissible to throw anything in or around the church due to safety hazards: no rice, birdseed, flower petals, confetti, bubbles, or anything else. Sparklers and balloons are strictly prohibited inside or outside the church. Animals of any kind are not permitted in the church or to be released following the wedding (including doves, butterflies, dogs, etc). We do not allow wagons in the Church. Absolutely no alcohol or tobacco (or any other drug) is allowed on the church premises. If a member of the wedding party has been drinking alcohol before the service, that person may be asked not to participate in the wedding. The abuse of alcohol by the bride or groom will invalidate the Sacrament. Video lighting and flash are not permitted during the liturgy (Call to Prayer through the end of the Recessional music). Photo and video lighting racks are not permitted. Photographers and video personnel and their equipment are to be as unobtrusive as possible. They should not interfere with any aspect of the procession, liturgy, or recessional. Video equipment must remain stationary. Wiring or cables may not be taped anywhere in the Church. Photographers are not permitted in the sanctuary (the area from the base of the stairs on up), or any other place deemed inappropriate by the parish staff. There are several good areas from which to videotape or photograph a wedding liturgy at College Church. The Wedding Coordinator or Sacristan will be glad to show you where these are. Excessive moving around during the liturgy is to be avoided. Feel free to move up and down the side aisles, but not in the center aisle once the entrance procession has finished. The altar is sacred; nothing should be placed upon it, nor should it be used as a prop. Standing on pews or chairs for any purpose is not allowed. The choir loft is inaccessible for anyone. We allow for 30 minutes after the ceremony to take posed shots at the altar. Casual photos are permitted before the ceremony outside and in the preparation areas. After the wedding procession, we ask that photographers and videographers remain respectful of your family and guests and keep a low profile. We provide a guide for photographers and videographers upon request. It is the responsibility of the wedding couple to ensure that the photographer and videographer receive these policies and abide by them. You will be assigned a Wedding Coordinator and Sacristan to assist you and your wedding party for the rehearsal and the day of the wedding. Your Wedding Coordinator will meet you and your party at your rehearsal to go through your ceremony checklist and walk you through your ceremony. Your rehearsal SHALL start promptly on time. Due to many rehearsal scheduled on the same day, if the rehearsal is held up for more than 10 minutes from the start time, the rehearsal maybe canceled. The day of the wedding, the Sacristan will assist your priest with all that he will need for your wedding and monitor groomsmen assembly area. The Wedding Coordinator will help monitor the bridesmaid’s assembly area, monitor florists and photographers, start the wedding on time and see to it that your wedding ceremony runs smoothly. Personal calls and texts should be made outside the Church. No cell phone photography during the wedding ceremony. The following checklist is provided to assist you in preparing for your wedding ceremony. 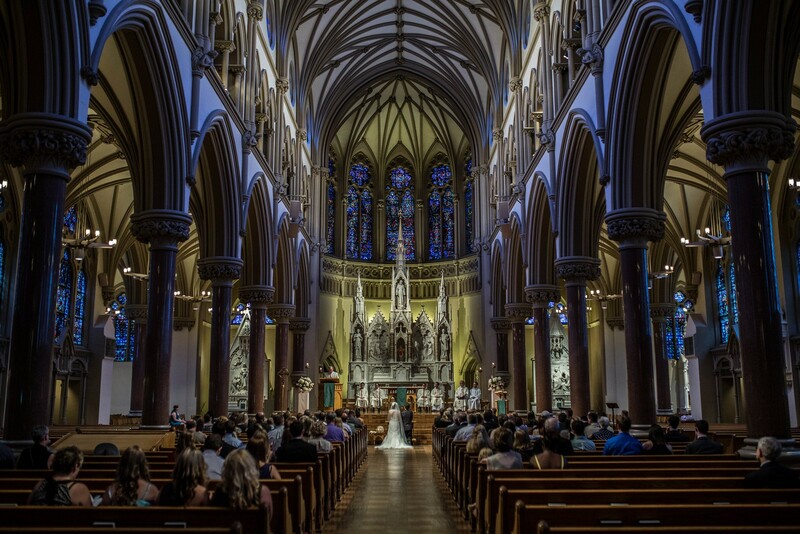 Secure a Priest or Deacon to officiate and prepare you for your wedding (if they are from out of town, they must provide a letter of suitability from their Archdiocese to the Archdiocese of Saint Louis). Inform College Church of your selection. Make reservations for Pre-Cana workshop. Finalize music with Sue Martin. Select readings and prayers for the liturgy. Priest or Deacon (officiating at your wedding) completes and sends Pre-Nuptial Investigation Form to College Church. Get your Missouri Wedding License. Make your final payment 2 weeks prior to your wedding if you didn’t pay in full at the time of making your reservation.